The Duoclean protective spray Cat. No. 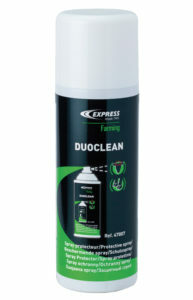 47007 brought to you by Express Farming is particularly recommended following dehorning. This 340 g butane / propane cartridge Cat. No. 556 has been designed for use with the Cat. No. 114/1 dehorner in the Express Farming range, as well as the Terra portable hair remover Cat. No. 15655.